I would like to welcome Gina Clifford from Spotty Banana blog to The Book Chook. What do you do when your child is obsessed with reading everything about dragons or cats or mysteries? Or what if your kids are learning about the Holocaust, and you need some recommendations for appropriate reading material? It's not always easy to find quality children's literature. Flashlight Worthy is a website dedicated solely to handpicked book lists organized around hundreds of topics. 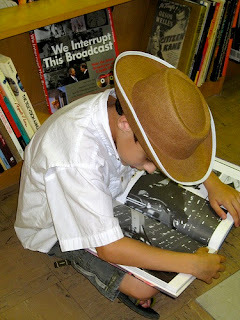 For example, there are interesting lists with titles such as "Great Reads for Culinary Kids" and "Books to inspire Book-Loving Boys"
Although lists aren't solely for children, simply use Flashlight Worthy's search form with the keyword "kids" to find interesting reading lists about all sorts of topics relating to children. Here's the link to the Flashlight Worthy search result set using the keyword "kids". Otherwise, simply scroll through the lists and check out the book lists for Children, Tweens, and Young Adults. Creating a free flashlight Worthy account will allow you to build your own list of books you want to read - Flashlight Worthy can then give you custom book recommendations based on your lists. Or, if you have lists of your own to share, simply fill out the "Contribute a List" form on the Flashlight Worthy website.